We’re saying goodbye to 14 teams until fall so here are a few things I’m going to miss over the summer: Hornets’ play-by-play guy Eric Collins’ “KEMBA!” yells, these Andrew Wiggins braids, in-season Kings chaos, Metta World Peace 4th quarter minutes for us tank enthusiasts, intentionally avoiding the Pistons, Whiteside’s career-year in assists (0.8), Embiid shenanigans, Joel Meyers, the Wolves cool new logo that looks like the rich man’s logo to the team’s SB Nation blog, Jokic dimes, seeing Towns in person that started his three-month tear aka putting the entire league on notice for his future MVP season(s) and reverse-jinxing the Nets pick and the Celtics’ 25% lottery odds of getting the no. 1 overall pick. Things I won’t miss this summer: Tom Thibodeau yelling, Lakers play-by-play guy Bill MacDonald’s awfulness, people not making the efforts to pronounce European players names correctly, the DNP-Rest narrative, Embiid injuries, the Knicks in general (aside from broken Carmelo Anthony), Towns emotion fusing itself into Clippers-esque whining, whatever the hell Orlando is doing, players wearing Adidas Crazy Explosives, Mark Cuban trolling Russell Westbrook along with his overprotectiveness of Dirk Nowitzki, Brandon Knight’s six-pack antagonizing me and sleeve jerseys. Taking a 24-second violation at the end of games: this bullet point was originally cut from Vol. 1, so it’s only right it became a thing down the stretch. I understand if the game is in hand, and the team seconds away from victory has the ball with a difference of a few ticks on the shot clock and game clock shouldn’t shoot anymore because it shows up the losing team. I get it, I get it, I get it. However, no one wants to admit it’s easier to run a quick little play to just get the shot at the rim, which will prevent a stoppage possibly forcing officials to get bench players, coaches and miscellaneous off the court to play a couple more meaningless seconds makes the most sense. We’d save so much time, plus not have to dig up old plays to show the hypocrisy of reacting teams and players such as the Raptors and Brandon Jennings taking shots while up big late when they didn’t need to like the fine people over at NBA Reddit did. Popovich’s difficulty trading for Kawhi Leanard: Can’t recall how many times I’ve had to hear some announce team – local or national – share the anecdote of Gregg Popovich trading away George Hill for Kawhi this season and how difficult it was. I feel like I hear it every other time I turn on a Spurs game, which make some sense when the Spurs local announce team is one of the five most unlistenable crews and normal people avoid them at all cost. I understand Hill was one of his favorite players and he traded a starter for a rookie on draft night but it feels too much, especially when Popovich can be considered an antagonizer for 1) how he treats sideline reporters and 2) because he’s to blame for the players resting problem Adam Silver has to run to his owners to get under control. I’m not sure if it’s Spurs propaganda or the media running with one of the few Popovich stories that humanize him and they choose to run it into the ground but I’ve grown tired of hearing this story. My All-NBA Dude-Crush Team: A few weeks ago on ESPN’s TrueHoop mailbag podcast, they rattled off a list of most attractive NBA players from presumably casual women fans. Some were surprises, some made sense, but it made me think who in the NBA I think are attractive. Since NBA Awards on many minds this time of year, I decided to create a 5-man team of NBA players I find respectively attractive to the point if my (hypothetical) girlfriend and I were out and encountered one of these guys, I’d surely grab her hand, hold it tighter if already holding it, place my arm around her, direct her attention away from one of these five guys, or all of the above like normal insecure men out in public do (Don’t act like you’ve never seen it). Frontcourt consists of The Stifle Tower Rudy Gobert in the middle, with Suns rookie Marquese Chriss and Wave Papi himself Kelly Oubre Jr., along with Patty Mills and the token white guy Gordan Hayword to round out the backcourt. Wave Papi is the MVP. Stay away from my (hypothetical) girlfriend, Kelly. Playoff Preview: I’m not the biggest fan of postseason predictions for two reasons 1) everyone does it and 2) the internet is just a wonderfully barbaric place to mock people for being wrong for a prediction even if the team you picked wins the series in a different amount of games than you picked. You’re going to be ridiculed for being wrong even if picking the right outcome, which is peak Internet I’ll pass on. Rockets-Thunder should be fun for obvious reasons, Clippers-Jazz will surely be interesting, and I’ll also have my eye on Raptors-Bucks. My one semi-take going into the playoffs: I wouldn’t be surprised if Toronto beats Cleveland in the semis. I not picking the Raps in a potential conference finals rematch (because I learned my lesson from those Pacers teams earlier in the decade) but if it happens, I won’t be shocked like the rest of the world would be. We already knew the Sacramento Kings were a semi-deep wet spot of incompetence lying in the middle of their new arena, but they decided to top themselves with this latest act of ineptitude by trading DeMarcus Cousins (and simultaneously ripping away $30 million from under him) for a new iPhone charger you’d get from a mall kiosk, Great Value potato chip crumbs and a hole-puncher. I’m not sure which Vlade Divac back-breaking assist is worst this or his to Robert Horry fifteen years ago. And owner Vivek Ranadive is continuing to find new ways to be the basketball operations equivalence of the Maloof Brothers by crippling that franchise. Divac and Ranadive are some unholy front office 1-2 combination. I wouldn’t be surprised if they’re running fans out of Sacramento and to Fresno after this. I am glad Boogie was finally able to unload the burden of that team, only to ascend up a level in the competent NBA franchise rankings to New Orleans, but at least he gets to reek havoc with Anthony Davis for a year and a half. Also, I sure hope Bobby Hield is at least better than Jonny Flynn. After Sacramento had their incompetence fully showcased, the Lakers decided to one-up their Pacific division rival by shockingly cleaning house within their front office and set the stage for the Magic Johnson-Jeanie Buss era of business — for better, for worst. While Magic rises from advisor to President of Basketball Operations in record timing, the first major move looks to be bringing in player agent Rob Pelinka on as general manager in what is considered by some a smart, forward-thinking move to replace widely revered Mitch Kupchak, who’s been with the team since Ronald Reagan was in office. The optics for change can’t be argued, however, the way it got to this juncture that included hit-piece after hit-piece after hit-piece from Jeanie’s vindictive standpoint looking to oust her brother Jim Buss from his executive VP of basketball operations role to the unthinkable timing of not doing so until two days before the trade deadline is unfathomable. While Grey Tuesdaywas a roller coaster of emotions for many that saw the execution of Jeanie and Magic’s spiteful master plan to take full power over the Lakers, even coming from a cynic like myself, I couldn’t complain about Magic’s first day of President of Basketball operations. He got done what needed to get done: trading Lou Williams for an asset. I also find myself at ease knowing Pelinka is in the fold with the praise he’s somehow garnering with no experience under his belt. Choosing to accept change for the better, while still being able to see through Jeanie and Magic’s smiles after the blood they shed. Just know, Kupchak was in talks over Cousins with the Kings and refused to include rookie Brandon Ingram in the deal even though he knew it’d likely save his job, nor did Magic and Jeanie thank any of the men they fired in some fashion. I’ll accept change, but you can’t fool me with a smile, even if it’s as bright as Magic’s like the rest of this city. …We’re headed towards Andrew Bogut being bought out by Dallas in March and Cleveland picking him up as revenge for adding Anderson Varejao last year and Bogut setting illegal (and sometimes dirty) screens on Warrior players in June, aren’t we? I just have a feeling. Can Nike get a jump on next season when they take over for Adidas in the league’s new apparel deal by taking over when action resumes Thursday? Sleeves, home jerseys on the road and road jerseys at home, it all needs to stop. Please, Adam Silver. Please, Kiki Vandeweghe. Let’s make this happen for the sake of weak eyes across the world. Tony Parker and Patty Mills – Tony and Patty sounds like a 50s sitcom couple that CBS’ target audience would watch faithfully, not two key parts of the Spurs’ chances to dethrone the reigning two-time Western conference champions. Seem like ages ago Parker was seemingly going head-to-head against LeBron in the Finals. We’re obviously not watching that same Tony, many times watching San Antonio I forget Parker is even playing. What’s also well-known is the impact of Mills in wake of Parker’s decline these last few years, and coach Greg Popovich seems to realize this by easing the two into their prospective roles. Parker is averaging a career-low in minutes in 43 games played, while Mills is enjoying a career-high and has played in every game except one. There’s only a 49-minute difference in minutes played between the two, but Mills holds a team-high 13.7 net rating. They’re going to need this from Mills, and a lot more from Parker if they hope to knock off the Warriors. Much reason many fail to give San Antonio a chance to beat Golden State is the guard play. Guard play is as important as ever in this new NBA and not knowing what Tony Parker you’re getting this spring along with Mills mostly known for his reserve role makes it difficult to believe they can stop the modern backcourt standard up in Oakland. Tim Hardaway, Jr. has been pretty good this season for Atlanta. The Hawks hold a plus-5.4 net rating when he’s on the floor, the highest on the team with at least 900 minutes played, and a minus-6.3 when he’s off. He’s emerged as a quality rotation guy for Mike Budenholzer which leads me to ask: why did the Knicks not want him again? They gave up on him for Jerian Grant, who they traded for Derrick Rose, who they’re reportedly looking to trade by the deadline? Good grief, Phil. Hardaway Jr. would be a nice little piece to go with Kristaps Porzingis’ timetable and yet Porzingis has been banged up this year, not to mention having his soul slowly taken from by the daily Knickerbocker grind. Already too much Knicks-related stuff in here, let’s quickly move on. Not sure if I can properly convey in words the amount of disgust that overcomes my body when a camera shot of announcers or sideline reporters are obviously talking into the camera with fans in the background soon realizing they’re on TV leading to that one irksome kid dapping with Russell Westbrook ferocity for the camera. It doesn’t matter whether it’s a quick one or continuously, you can always expect it. Of course, this extends beyond NBA games and sporting events in general, but still, it’s one of the many nightmares going in sports right now and I’m sickly tired of it. Overtime is a bit different now. It didn’t hit me until the Hawks-Trail Blazers game from 2/13 to realize it where Portland scored the first 7 points only for Atlanta to score the remaining 12 points to win. I remember when the extra five minutes caused enough uneasiness that if your team went down four points it felt like it was over. Not anymore. The following day, Celtics radio play-by-play was on The B.S. Podcast essentially confirming some of my thoughts lamenting overtime rules should probably be modified to four minutes. The new NBA, even overtime play feels different. Back to this flat-earth epidemic: I seriously need for more players, coaches, announcers, trainers, general managers, team social media correspondents, mascots, owners etc. to come out and share which side of the street they’re on in this. This might be the most interesting story the rest of the season until Cavs-Warriors III. I already see myself watching a random Bucks-Wolves game on a Tuesday and wondering who on the floor actually believes the earth is flat. Does Giannis think they word is flat? No, right? What about KAT? 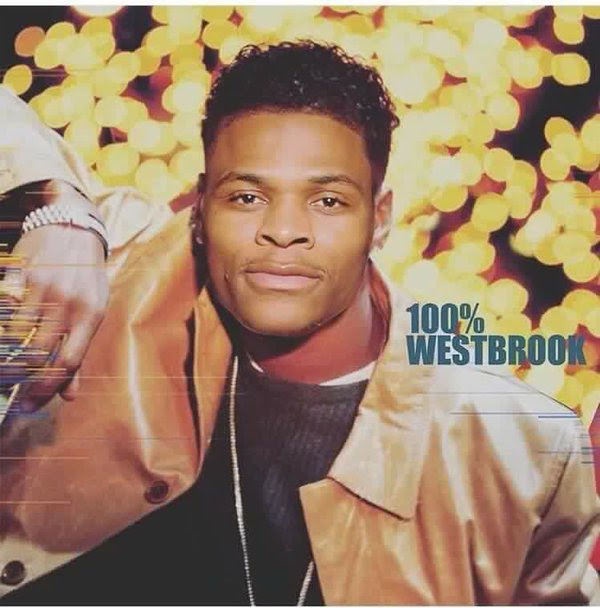 No, what does Russell Westbrook think? Are there more young stars along with Kyrie and apparently Draymond Green who believes this? Were they flat-earth-ganging Carmelo Anthony over the summer when he gave us another perfect meme? To hell with Durant vs. Westbrook, I need more flat-earth questions. It’s probably a matter of time until someone over in the Kings front office admits they’re a flat-earth truther and it’ll all make sense. Way back in my old Tumblr days, in efforts to gloss over (or maybe ignore) a substantial topic, I’d turn to this thing I apathetically christened DJ’s Random Sh— like the true narcissist I am. It was self-explanatory: I’d share insight on the most random topics instead of sticking to one topic. This is considered the simplest standard blog template everyone has used one way or another—it’s essentially Twitter without the characteristic shackles. I personally like this way because I find it more comforting to able to branch out in different directions when the landscape is so huge. Also, there’s a sense of freedom knowing you’re not confined by one topic, especially when there are so many things happening, so many things that evoke opinions or thoughts. So my plan is to bring that familiar format here to Cove Alpa and use it on the NBA. Every several weeks until Adam Silver hands over the gold trophy, I’ll come by and attempt to put words together from what I’ve noticed, liked, disliked, questioned, etc. from the NBA world—my irrelevant NBA insight. I watch more basketball than I should, so there might be a lot of output. The ramblings and randomness will attempt to offer an extended version of the micro-blogging service we all know and love hate. There won’t be too many takes, as we all know the Internet needs less of them, but I’ll attempt to give easily digestible, scattered thoughts around the league. 3-Headed MVP Race: The three top candidates for MVP are James Harden, Westbrook and Durant. The three of them are at the forefront of the MVP race now that the three reside on separate teams draws some weird parallels to Seth Rollins, Roman Reigns and Dean Ambrose, formally known as The Shield. Wrestling is fake, obviously, but the storylines are just as compelling if not more. Since, all three have generated individual accomplishments and blossomed since going their separate ways after being teammates—Durant and his team is the favorite to win the championship, Harden is the MVP front-runner with the magic him and Mike D’Antoni has concocted and Westbrook is looking to do something that hasn’t been done in fifty-five years. Hopefully their reunion next month in New Orleans is as fun as The Shield’s. I remember seeing Haralabos Voulgaris say on Twitter Al Horford doesn’t rebound well. Ever since then, when I check Celtics box scores, I like to see how many rebounds he snatched down. It’s essentially a nighty box score game similar to the old Did Nick Young Get an Assist Tonight? game that eventually became the Did Hassan Whiteside Get an Assist Tonight? As for Horford, he’s averaging his lowest rebounding number of his career, but is still holding a respectable rebounding percentage as he’s sandwiched between other notable NBA centers who’ve recently ventured to the perimeter to shoot threes in Marc Gasol and Demarcus Cousins. It’s just a fun thing to look out for during nightly box score check. The Giannis Coming out Party: The amount of joy I have for the Giannis Antetokounmpo’s exciting run these past few weeks is unprecedented for player who isn’t apart of the Lakers for me. Knowing how endless his potential was watching him in his first three seasons and seeing him making the leap (or in his case it’s a eurostep) into what’s he’s blossomed into this year has been oddly gratifying for some reason. And how everything has aligned as well as it has: Milwaukee getting TNT/ESPN airtime, the nightly eye-popping Vines and highlights, the Lee Jenkins feature, his first game-winner at MSG, the first All-Star vote returns, the duel with Kristaps Porzingis a few nights back. His stardom has emerged as the rest the world has finally caught on at the right time. It’s a pleasure watching Giannis bend basketball morphology. He just turned 22. Glad ESPN and TNT, the same providers who shelled out almost $3 billion to continue to air games nationally, is consistent in torturing fans with borderline unlistenable commentators. Yes, the product is great, but the people we’re forced to hear make pouring acid into our ears seem like a better idea. I enjoy looking forward to the Lakers being on national television and getting away from their own horrible play-by-play guy to get a breath of fresh competent commentary air only to be slapped in the face with the likes of Mr. Unlistenable Reggie Miller or Jon Barry consistently. I mean, 83-year-old Hubie Brown, the best color commentator on either networks was assigned to the most unwatchable of the five Christmas Day games. I hope Amazon Prime has acid for sale. “Hunker down. Probably a rainy night where you are. Snuggle with your favorite. Watch some Kings second half action.” – Jim Kozimor on CSN California during halftime of a winter Kings-Nuggets game recommending ‘Sacramento Kings Basketball and Chill.’ Sure, why not. We got a trade! (A few weeks later than expected since December 15th was the first day players who signed contracts over the summer were eligible to be traded.) BRING ON MORE TRADES, PLEASE! It can’t be stated enough how the NBA is in such an incredible position right now. Even though a few all-time greats that helped shape the post-Jordan era retired recently, there is still a substantial amount of talent spread across the entire league it’s unreal. The NBA has so much going for it—usual suspects like Steph Curry, LeBron James and Kevin Durant at the forefront; the emergence of young evolutionary specimens like Antetokounmpo, Porzingis, Joel Embiid, and Karl-Anthony Tows; Westbrook and his triple-double narrative; the growth in international play; pace and space continuing its astronomical boom; the golden age of point guards; the continual increase in ratings; value in franchises skyrocketing; a Finals rivalry between two teams with marquee players that reminds people of 80s Lakers-Celtics; the new television money causing the salary cap to explode paying everyone and then avoiding any sort of work stoppage that could harm all of this momentum and more. The NBA has everything it needs to surpass the NFL, especially with the troubled waters the latter has hovered over the last few years. It’s only a matter of time until people finally realize the true superior league that has an actual good product at the moment.